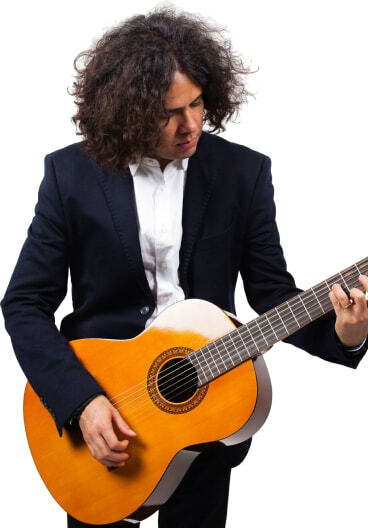 Solo classical guitar music ranging from Early Renaissance lute songs to Contemporary works. Music for all occasions! We are huge Tragically Hips Fans. Please provide music genres, song lists, and demos. 50th Birthday at the home, inside and possibly an outdoor fire pit (weather permitting). Lookin for an Intimate mingling from room to room entertainment type of thing. A mix of rock and popular music between the 60’s and present day. We are a very fun easy going crowd, and are looking for same in an entertainer. Acoustic. Electric. Steel. Flamenco. Bass. What do all of these words have in common?! They are all types of guitars of course! Want some serenading background music at your dinner event? Book a classical or acoustic guitarist. How about an extra guitarist for your rock band? Why then you'll need to hire an electric or bass guitarist in this case. Do your Flamenco dancers need some music to dance too? Well then get a Flamenco guitarist! No matter your event there is a guitar for that. So book the perfect guitarist for your event right here on GigSalad! Search for Guitarists in Ottawa, Ontario above. Please note that these Guitarists may also travel to Ottawa, Ottawa, Hull, Vanier, Rockcliffe, Hull, Gloucester, Nepean, Gloucester, Uplands, Britannia, Sainte-Cecile-de-Masham, Templeton, Chelsea, Aylmer, Orleans, Leitrim, Old Chelsea, Ramsayville, Navan, Kanata, Lac-meach, Cantley, Carlsbad Springs, Hazeldean, Manotick, Greely, Breckenridge, Edwards, and Otter Lake.